Customer relationship management (CRM) is fundamentally about managing and maximizing the efforts that help you develop strong relations with your customers and prospects. Organizations try everything in the book to keep their customers satisfied. And, when it comes to improving customer experience, one aspect that companies cannot afford to ignore is social media. That is where social CRM comes into the picture. Social CRM helps you learn more about your customers, and allows you to deal with them proactively. CRM today is the fastest growing software market in the world, expected to reach $48.4 billion by 2020 – while the social CRM market is set to reach $10 billion in 2019. Every organization should, therefore, have a social CRM strategy in place if it wants to understand the pulse of its customers. But there is more to a social CRM strategy than just gathering likes and followers to increase your website traffic. Therefore, it is important for businesses to formulate an effective social CRM strategy. What is a social CRM strategy? Adding a social aspect to customer relationship management is what lies at the core of a social media strategy. When the social aspect is added to CRM, it not only enhances your brand awareness, but also helps you achieve meaningful engagement with your customers. A social CRM strategy synergizes the efforts between your marketing, sales, and customer service departments to produce better results. When you combine social media with B2B sales, you can generate a more relevant outbound message and a better-quality response to inbound queries. A social CRM strategy mainly consists of two parts – social listening and social publishing. When you combine the two with your marketing and customer service efforts, it is bound to have a positive effect on your sales. Social media is a busy market, and most of your customers and prospects are present and active on it. If you don’t take note of what is going around you on social media, you are missing opportunities. Select the right social tool – Even before integrating a social CRM strategy, it is important for you to manage your social media efforts with social media management and analytics tools. The tool you select should assist with scheduling social posts across all major platforms, track and monitor who says what and to whom, and in interacting with your customers – as well as integrate with your existing CRM tool. Target the right platforms – It is vital for you to select the right networks for your business. If you own an e-commerce site, it can suit you to choose platforms like Instagram or Pinterest, but it will certainly not help you should you select these networks for your software company. For a software company, it is best to choose networks like Facebook, Twitter and LinkedIn. You should also start monitoring a platform if you notice that your customers start moving to a new social network. Regardless which platforms you select, however, be sure to respond to your customers’ questions, concerns and complaints in a timely manner. Keep track of interactions and mentions – It is important that your social CRM platform has the capability of setting up feeds and streams for each social networks and other specific parameters within them. Apart from tracking your customers’ tweets, likes and comments, you should set up streams that can monitor specific keywords – such as your company name and other primary keywords associated with your industry. As soon as your name is mentioned on the social network or someone asks a question, your representatives can quickly respond. Pay attention to analytics – It is vital for you to make analytics your friend. After identifying a customer, you can use analytics to find out more about him or her. You can get to know the reach of the tweet in which the user mentioned your product or service. You can also get to know whether the user mentions something about any of your competing products and the context in which it is used. You can send a user’s profile and their specific data through the CRM pipeline to your sales and marketing team, and with the help of the analytics, they can help them to convert into your customers. 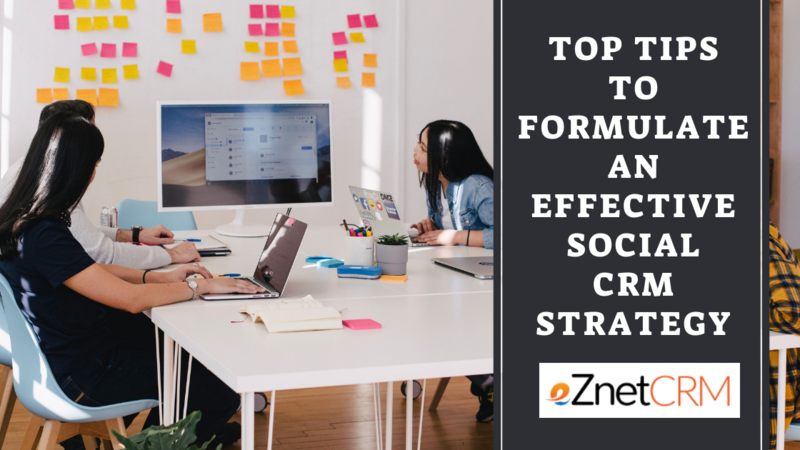 Form customer groups and have targeted interactions – Your social CRM strategy should exploit all the existing capabilities that social networks have to offer. For example, Twitter has lists while Facebook and LinkedIn have groups. With this functionality in place, you can group customers into segments and start targeted interactions with them about your products. With the help of social CRM, you get to know the user more closely, and can tailor your interactions accordingly, which allows you to win over prospects while retaining current customers. Offer real-time customer service – Today’s customers are smart, yet impatient. And nothing frustrates a customer more than waiting endlessly for a response. We are in the age where real-time customer service is what help companies retain their customers. Your team should respond to customer queries on social media within an hour. Make sure that the conversation is a genuine interaction rather than an impersonal response – as in “We know you have a choice in widgets, thank you for choosing ours.” You should also integrate your social media and customer service teams into one unit, which can improve the quality and speed of your response. Use social incentives to nurture brand loyalty – If you want to turn your online presences into communities, develop a strong relationship with your loyal customers who are active on social media so they can act as influences. You can run a promotional campaign on Twitter or Facebook to reward your best customers. You can pick up the most active user in your community every week and reward them. You can also send promotional codes or discount offers to a few of your most engaged customers. While social media allow businesses to get in touch with a wider array of customers instantly, it is social CRM that helps you to make the most of these connections. Don’t delete negative comments – Despite offering the best products and service possible, you will still encounter dissatisfied customers who post negative comments on social media. Unless the post is offensive or inappropriate, you should not delete them because deleting a negative comment can be more harmful to the reputation of your business. Address legitimate complaints and offer the customer what’s needed to make the situation right. A proactive and professional approach is the best way to deal with negative feedback. If you are looking for a CRM system that offers social CRM functionalities, eZnet CRM is a powerful tool for companies to develop strong relationships with existing and prospective customers – as well as generate top-quality leads.